One of the male chicks flew to the top of the parking deck and photographer Dave C picked him up early this morning. The DNR biologist decided that the fledgling should go to rehab since the parking deck is not a safe place and he would probably end up some place even less safe than the parking deck on his next foray. I can’t believe he made it as far as the deck since he still has lots of down. 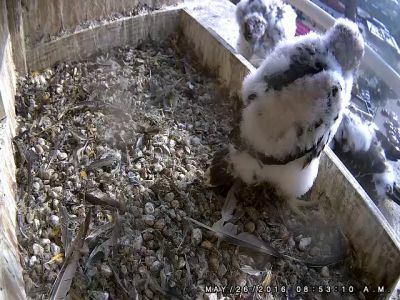 The other male is currently in the parapet window well and looking quite perky. He can get up to the window ledge and look in the window, so the DNR will give him some time to see if he makes it up to the ledge on his own. If not, they will try to lift him up without spooking his sisters who are watching their brother and looking in the window from the ledge. Mother Rebecca is staying close by and voicing her concerns and ideas to the folks on the 14th floor.